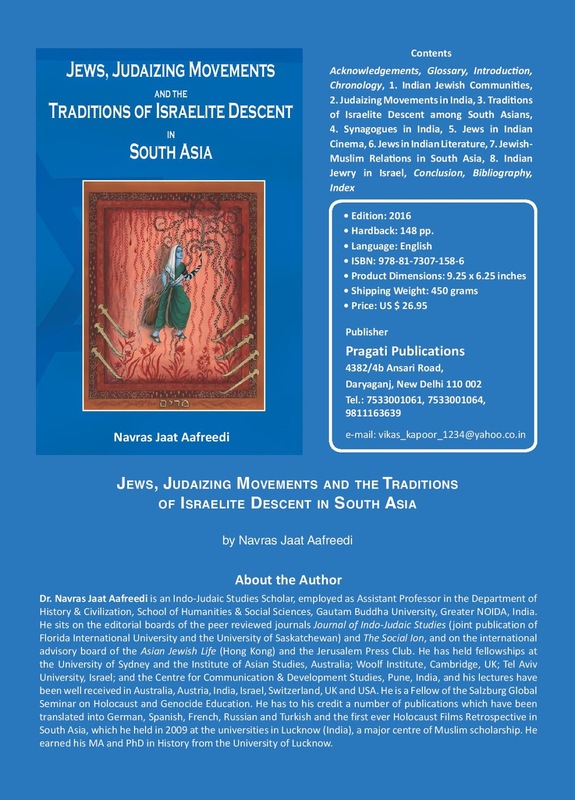 This book is based upon the doctoral dissertation of Navras Jaat Aafreedi, a historian who has distinguished himself by seeking to make Indians and Pakistanis, especially those of Muslim heritage, more aware of, and sympathetic to, the history of Jews in India, the Holocaust, Jewish practices and perspectives. In a country where “Hitler” is today often given as a name to children, and where the dictator is admired as someone who could instil order and discipline, Aafreedi’s efforts to bring to Indians an understanding of the Nazis’ attempt to implement a “final solution” to the so-called “Jewish problem” are imporant. Ironically, these attitudes subsist in a population generally not ill-disposed to Jews, but are rather for the most part unfamiliar with Jews and their sensitivities. In this context, Aafreedi’s sympathy for Jewish concerns is greatly appreciated. India’s vast population has included no less than three minuscule Jewish communities, and in recent years it has also seen the rise of new Judaising movements, groups who have come to adopt some form of Judaism, either out of a belief that they have Jewish or Israelite origins, or a conviction that Judaism is the “true” religion. In addition, as Aafreedi shows, there are also a number of communities in India, Pakistan and Afghanistan who have traditions of Israelite descent, among them his own Afridi Pathan patrilineal clan. Whereas there have been many studies concerning the Jewish communities in India, and in recent years the Judaisers, there have, to the best of my knowledge, not been any other works that have included communities with traditions of Israelite descent alongside the other two categories. Here, Aafreedi has essentially broken new ground, drawing attention to these groups, for people with an interest in the Jews of India. Aafreedi devotes a chapter to each of these categories. Chapter 1 covers the three historical Jewish communities in India: the Bene Israel from coastal Maharashtran villages south of Bombay (Mumbai), the Jews of Cochin (Kochi) in Kerala, and the Baghdadi Jews who were settled predominantly in Bombay and Calcutta (Kolkata). The origins of the Bene Israel and Cochinis are shrouded in mystery, both communities having been settled in India for hundreds, if not thousands, of years. The Bene Israel were historically scattered in villages of the Konkan coastal region, where they had a caste-like occupation as producers of sesame oil, the main cooking medium in western India. The fact that they did not work on Saturdays earned them the name “Shanwar Telis”, Saturday Oilmen (p. 5). Although they had very little Jewish knowledge, they knew enough to maintain kosher dietary restrictions, and they practised group endogamy, in keeping with Jewish traditions and the Indian caste system. From the eighteenth century, Bene Israel began to settle in Bombay, where they were eager to learn more about Judaism through contact with Baghdadi and Cochini Jews, and ironically through western Christian missionaries, who translated the Bible into the Bene Israel’s Marathi language and taught Hebrew. The Bene Israel were grateful for what the missionaries had taught them, but very few of them adopted Christianity. Aafreedi devotes almost four pages (pp. 2-5) to the issue of recent genetic testing of Bene-Israel, whose Jewish ancestry had long been called into question, but their claims now seem to have been vindicated, through studies (quoting Waldman) “which demonstrate that the community is genetically more similar to other Jewish communities than are all the Indian and Pakistani communities”. Many Bene Israel apparently display the “Cohen modal haplotype”, common among Jewish Cohanim. Aafreedi quotes the researcher Tudor Parfitt, that this “leaves just a billion to one chance of a mistake in identifying who the Bene Israel really are” (p.4). Whereas the Bene Israel had only vestigial knowledge of Judaism until modern times, the Jews of Cochin were always able to maintain connections with the rest of the Jewish world and maintained orthodox practices. They have had a distinguished past, with one King Parkaran Iravi Vanmar having bestowed upon a certain Joseph Rabban the village (or city) of Anjuvanam (also known as Cranganore) in perpetuity, along with various hereditary privileges, enumerated on copper plates, inscribed in three languages (see page 8 for an English translation). During the fifteenth and sixteenth centuries, the Portuguese harassed the Jews, on account of their religion, and as rivals in the pepper trade. In 1564, the Portuguese attacked Cranganore, which by then had been in a deteriorated state. The Jews who fled were welcomed and given shelter by the Raja of Cochin, who allocated to them land adjacent to his palace to build the Pardesi Synagogue (p.11), which celebrated its 400 hundredth anniversary in 1968 (p.41). The “Baghdadi” Jews, hailing from Iraq and other countries of the Middle East, began to establish themselves in India late in the eighteenth century. A mercantile community, they prospered under British rule, and many sought to emulate the British. Over time, the language of the community shifted from Arabic to English, as Baghdadis sent their children to English language schools. Aafreedi observes “Hardly any attempt was made to master any Indian language, though most Baghdadis became acquainted with Hindustani of a simple sort” (p.14). Seeking acceptance from the British rulers, they sought to distance themselves from “native” Indian Jews, especially the Bene Israel. Aafreedi’s next chapter looks at the Judaising movements of the “B’nei Menashe”, a group from North East India who have adopted Judaism out of a belief that they were descendants of the biblical tribe of Manasseh, the “Bene Ephraim” from Andhra Pradesh who assert descent from the tribe of Ephraim, and members of “the Chettiar community of Erode in Tamil Nadu” (p.21). The B’nei Menashe have been practising Judaism since the 1970s and many have come to be accepted as orthodox Jews after undergoing conversion in Israel, thanks to the support initially of Rabbi Eliyahu Avichail and his Amishav organisation, and later by Michael Freund and the organisation called Shavei Israel. Several thousand have settled in Israel since 1989 (p.17). In 2005, attempts to formally convert B’nei Menashe to Judaism in India created a diplomatic incident between India and Israel (p.17). The Bene Ephraim are a more recently emerged group of 125 families, who come from a Harijan/Dalit caste background (p.21). Subjected to harsh discrimination from caste Hindus, the assertion of an Israelite past is hopefully a means to a more respectable status. This group takes its lead from the college-educated members of the Yacobi family. However, because of the poverty and lack of education of their followers, most have very limited Jewish knowledge. The Chettiars only embraced Judaism in 2011, “when 1500 congregants of the Zion Gospel Church abandoned Christianity for Judaism under the leadership of their pastor Samuel Devasahayam and renamed the church Zion Torah Centre” (pp.21-22), and they have a dream of settling in Israel to help “make the desert bloom”. An urban community without experience in agriculture, they have purchased farmland growing coconut trees, to practise farming and so to prepare them for their prophetic dream (p.22). These 3 Judaising groups, as diverse as they are, had all been practising Christians before adopting Judaism. By contrast, the communities with a long tradition of Israelite origins are predominantly Muslim and do not show signs of wishing to revert to their putative ancestral religion. Indeed, we learn that “they are so strongly anti-Zionist and anti-Israel and also greatly prejudiced against Jews” that they are not interested in migrating to Israel (p. 25). Apart from the tradition of Israelite origin of the Pathans and similar claims about Kashmiris (pp. 29-31), there are assertions that the kings of Afghanistan were descendants of King Saul in the Bible (pp. 25-26). Several Muslim groups who are known as “Bani Israil” – children of Israel, are said to descend from a Jewish-born companion of the Prophet Muhammad, while the Qidwais, believe their progenitor, a Sufi mystic of the twelfth century called Qazi Qidwa had been a Jew (p.24). One group with a postulated Jewish ancestry who are not Muslims are the Kananya or Thomasite Christians, an ancient, Syrian-Orthodox community in Kerala, close to the Jews of Cochin, apparently around 200,000 in number. They are reputedly endogamous, use Aramaic in their liturgy, and have customs and songs which resemble those of the Jews in the area (pp.36-38). From Chapter 4 onwards, the book looks only at the Jews of India, with no further exploration of the Judaisers or communities with claims of Israelite descent. Aafreedi focuses on the history of synagogues in India, Jews in Indian cinema and literature, Jewish-Muslim relations, and Indian Jewry in Israel. These are essentially distinct essays, interesting in themselves, but not woven together to create a consistent narrative. Aafreedi is clearly passionate about the cinema and provides a fascinating expose of the role that Jews, particularly Baghdadi women, played in the early years of Indian film, and in beauty pageants. In part this may have been due to their generally lighter complexion than true Indian women, but after the end of the silent movie era, those who could not deliver lines in an Indian language lost their appeal. … they did not have the reservations that women from other communities in India, including the other Jewish communities, the Bene Israel and the Cochini (resident in India for a much longer time than the Baghdadis), had when it came to indulgence in performing arts. By doing so they paved the way for women from respectable families from other communities to follow suit (p.54). As impressive and heroic as this may seem to be, it is noteworthy that in effect these heroines of the silver screen had thereby cut themselves off from their native communities, breaking the Jewish taboo of marrying out of the faith, most of them taking Muslim husbands. As liberated as these women may have been, it would seem that either their Baghdadi communities were not in tune with them, or that having shed the inhibition of putting oneself in the public view, other restrictions no longer mattered to them. All the books I found were written about the Jews of Eastern Europe or America. There was nothing about us. On the library shelf, there were some books about the Bene Israel, but it was all anthropology. They’re looking at you through a microscope: “Are you Jewish, aren’t you Jewish: this tradition, that tradition.” And then the history. But there was no humanity, the human touch was missing (p.73). I was delighted to see a reference to “a short-story writer named Moses Aaron who is based in Australia” as apart from Jael Stillman, the only writer to have emerged from the Baghdadi Jewish community of Calcutta (p.74), but disappointed that Aafreedi did not specifically mention or analyse any of his works. I was also irritated, I must admit, with the attention that Ruth Prawar Jhabwala received in two chapters of the book, with much the same information appearing in the chapter on cinema and the chapter on literature. As impressive as she is in both media, and taking account that she did not have an Indian heritage, it would have been preferable if her work could have been discussed in the one place. I found the chapter on relations between Jews and Muslims in South Asia uncomfortable reading, as more than half the chapter concerns Jews who converted to Islam, notably the seventeenth century Sufi poet Sarmad, along with several Mediaeval figures, and Leopold Weiss who took on the name Muhammad Asad after his conversion to Islam - a brilliant scholar and Pakistani diplomat. I do not see this as relations between Jews and Muslims, except to the extent that we might learn how these men, as Muslims, view their former coreligionists. While there have been instances of mutual respect and cordial relations, and it is heartening to learn of Khurshid Imam who teaches Hebrew at the Jawaharlal Nehru University, and a Muslim, Thoufeek Zakriya who practises Hebrew calligraphy, Aafreedi also highlights increasing hostility to Jews, based on opposition to the existence of the State of Israel, and ostensibly religious grounds. Most of the Jews of India have left the country, even though they retain a deep love for it, and many travel back to visit. The final chapter treats the situation of Indian Jews in Israel, where most of the Cochini Jews and the Bene Israel have now settled. The chapter is well written and deals sympathetically with its subject, particularly with an extensive examination of the fight that the Bene Israel endured to be recognised as equal to all other Jews in the Jewish homeland. The Cochinis are presented as having had a more pleasant adjustment to life in Israel, “having integrated completely in an alien environment” (p.98). Although they had been an urban community, in Israel they were placed on agricultural settlements, where, Aafreedi quotes Shalva Weil, “they became rich” (p.89). This contrasts starkly with the assessment of Ginoo Zacharia Oommen, an anti-colonial Christian from Kerala, in the book Ethnicity, Marginality & Identity: the Jews of Cochin in Israel (New Delhi: Manak Publications, 2011). Oommen sees the Cochinis as a marginalised, isolated group, subject to racial prejudice in Israel. It would be interesting to see which of these perspectives is a more accurate representation of the reality. While today there are an estimated 5,000 Jews in India, around 80,000 Indian Jews live in Israel (pp. xiv, 85). Over time, as the migrant generation passes, it will be interesting to see the extent to which their descendants maintain their Indian languages and distinctive traditions, as also the extent that new Jews – the Judaising communities - will bring a new lease of life for Judaism in India. Australian Journal of Jewish Studies, Volume XXIX, 2015 - 2016, pp. 187-193.